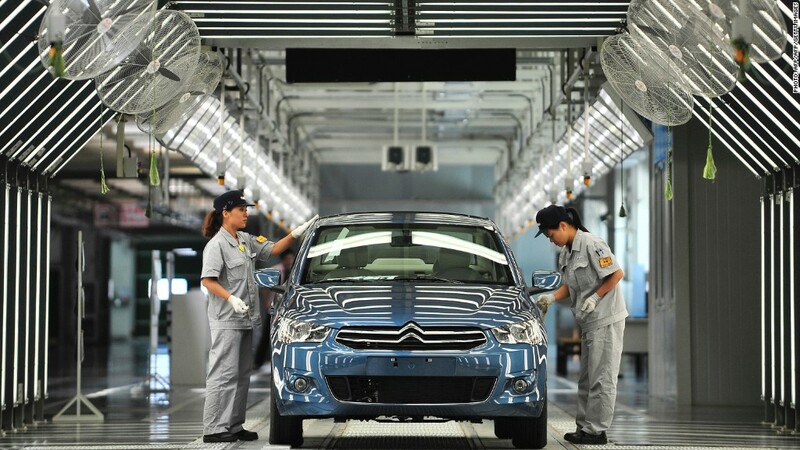 Employees working on the production line at a plant under Dongfeng's existing partnership with Peugeot. Dongfeng (DNFGF) has signed an agreement to purchase a stake of PSA Peugeot Citroen for 800 million euros ($1.1 billion), according to an exchange filing made Wednesday in Hong Kong. The French government will also acquire an equal stake in Peugeot (PEUGF) on the same terms. All three stakeholders will have two board seats as part of the deal. The partnership aims to sell 1.5 million units starting in 2020 under the Dongfeng, Peugeot and Citroen brands, and is considering setting up an export company to sell vehicles in Asia. This agreement expands on an existing joint venture between Dongfeng and Peugeot, which has allowed the French automaker to manufacture and peddle its models in China. "We are giving a new impetus to our group, with an ambitious industrial and commercial plan, and solid financial resources," Peugeot board chairman Philippe Varin said Wednesday in the company's annual report. Things haven't been looking great for the French automaker. Peugeot posted a net loss of 2.32 billion euros ($3.2 billion) last year, compared to 2012's staggering net loss of 5 billion euros ($6.9 billion). Sales fell to 54.1 billion euros ($75 billion) from 55.5 billion euros ($76.4 billion) the year prior. The company was Europe's worst performer in 2013 in terms of new car sales, as a sluggish economic recovery weighed on automakers. While the Peugeot family is losing full control of the company for the first time, the deal boosts the firm's presence in China -- a bright spot for the automaker. Last year, China sales surged 19% while sales in Europe fell 1.6%, where Peugeot has been losing market share to rival European carmakers like Volkswagen (VLKAF) and Renault. In an effort to turn around the company, Peugeot announced last year that Carlos Tavares, the former COO at competitor Renault, would take over as CEO, effective later this year. Shares of Peugeot rose 3% in morning trading in Paris. Shares have surged 37% so far this year on expectations of a deal with Dongfeng, which the company confirmed was under negotiation in January. Dongfeng shares fell 1.1% on Wednesday in Hong Kong, after the stock was suspended on Tuesday pending the announcement of its agreement with Peugeot. Investors in Dongfeng seem to be less thrilled with the partnership, and have sent the stock down more than 10% this year.